Common snapping turtles may be snappy but they’re quite interesting creatures. Their scientific name is Chelydra serpentine. You would think a turtle would not have "serpentine" in their name, something only reserved for snakes. Both have something in common though, they both snap up to get food. It is in the kingdom Animalia, phylum Chordata; class Reptilia, and order Testudines. The common snapping turtle looks like any turtle you come across, but it has a few distinctive qualities. 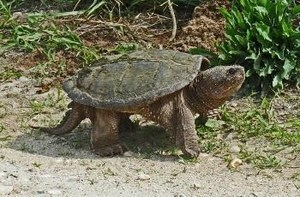 From their name, snapping turtle, they have a beak-like mouth that protrudes slightly and it’s sharp too like all turtles, they have no teeth. Common snapping turtles have tan or brown shells that are about 8 inches long; their scales are usually textured and rough due to bumps in their skin called, ‘tubercles’ which cover their necks and legs. The turtle also has webbed feet that help them with wading through water. Common snapping turtles’ omnivorous diet allows them to eat almost anything they can, from fishes to worms or vegetation in their surroundings. Despite their name, they are often exposed to predators, adults are often victims but turtle eggs or hatchlings fall victim too with hawks and bigger fish that prey on them. They are ferocious animals though, and will fight back and are important to ecosystems as it is an aquatic consumer. Common snapping turtles have great sense of smell, touch and vision to detect dangers or prey, and they can feel vibrations under the water. With mates, they tend to face each other and use leg movements to communicate with them as they face each other. Although they are both prey and predator, their life span is fairly normal and their life expectancy is around 30-45 years. Females tend to stray further from their homes more than males do, due to seasonal change. Common snapping turtles start hibernation late October and emerge from it around May; but they only stay around the marshes they are familiar with. Common snapping turtles, although cute and adorable as they are young, present a fiery and fierce personality. In the classroom, the turtle often likes to show it’s fiery personality when it’s being fed but often is bullied by the other turtles. Overall, Snapping turtles are common in the east. They are rather interesting and are different from most turtles. For example, one cannot just pet a snapping turtle because it will extend its long neck and deliver a painful snap to the hand. Through differences and similarities, snapping turtles contribute a lot to the aquatic system ecosystem and also provide an educational perspective in the classroom and to observers.